It's not every day that one finds oneself in the presence of both an apocalyptic piano and a working pipe organ made entirely out of Pringles® potato crisps cans. But that's exactly what you'll find in the Brooklyn studio where mixed-media artist collective, Fall On Your Sword (FOYS), took on the challenge of using the cans to create works of art with hot glue guns blazing. Will Bates (cofounder of Fall On Your Sword), Sarah Bereza (an artist and the self-proclaimed "catchall for anything visual" at FOYS), and Ryan Price (the resident audio post mixer) discussed the creative process behind their final masterpiece: a massive pipe organ that will be displayed and played at Gawker's fourth annual Silent Disco in New York City. Because the best part is, it actually works. Guests — maybe even you — will be able to play duets and jam out on this instrumental work of art during the event. Apparently, a functional pipe organ is the obvious artistic choice when deciding what to make out of the cans. "It happened in about a minute I think. One of us just said 'we should make an organ!'" As Sarah put it, "we were sort of like, duh. The shapes just sort of make sense." Most artists find motivation in the work of their predecessors; so it's not surprising that some of the inspiration for this idea was taken from the organ in The Goonies. It also elicits a (slightly more colorful) Iron Throne vibe. Thankfully, Joffrey will not be attending this year's Silent Disco. You think the Iron Throne looks like this? YOU KNOW NOTHING! Sarah was tasked with building the physical organ, which she created with the help of an iPad sketch and many boxes of Original, Sour Cream and Onion, and new Tortilla Pringles® potato crisps cans. "It kind of felt like back when I was a kid, building a fort or stacking blocks. The canisters are just asking to be glued together and cut at angles." Deciding to let the cans shine in all their classic glory was easy: "I toyed with the idea of painting the cans, but there's something Warholian about seeing all the guys with their little mustaches, so I wanted to do something with a pop art feeling. And that's why I used more of the red cans in the end. They're so iconic." FOYS is known for its interactive pieces, or, as Will describes them, "art that reacts like a musical instrument." Will and Ryan built ten keys below the organ's pipes by connecting the cans to springs. Pushing a key triggers a tone, causing air generated by hidden fans within the tubes to flow out of the pipes at the top of the organ. "We want the piece to feel like a real instrument, so the tones will be based on manipulated recordings of organ tones and resonances played through the cans themselves. Participants can make up their own tune, and have their own unique experience with the piece." Building a giant organ out of Pringles® potato crisps cans is hard work, so a fair amount of crisps ("you really don't want to count," Sarah admitted) were used as creative fuel for hungry artists. "I was just sitting on the floor, going for it. I was into the Original flavor because they're nostalgic for me," Sarah recalls. FOYS had a plan to avoid wasting the six garbage bags full of uneaten crisps: "We kept a bunch of the crisps on hand so that we could record the sound of the crisps rustling. This recording will be processed and serve as a percussive accompaniment to the organ tone." Spoiler alert: some of the crisps were used to create a companion piece to accompany the organ at the Silent Disco. You'll have to stay tuned to learn more! 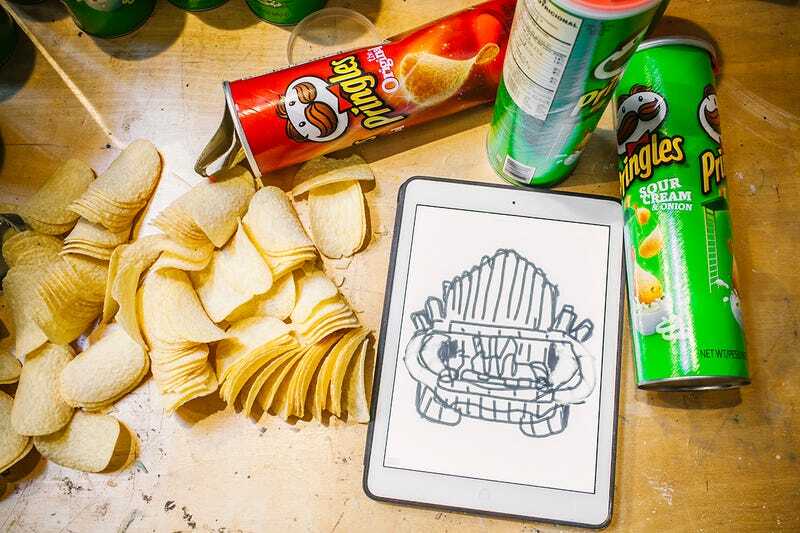 Feeling inspired to create your own artistic masterpiece out of Pringles® potato crisps? To enter the Pringles as Art contest, submit a photo, sketch, other rendering, or written description of your creative Pringles can or crisp creations to pringles@gawker.com with "Pringles as Art Contest" as the subject line. You'll have a chance to win an all-expense-paid trip with a friend to the Silent Disco, presented by Pringles. Contest rules apply. Submissions will be reviewed by Studio@Gawker, and a winner will be selected based on their creativity, innovation, and sense of fun. Head hereto learn more about Pringles, your raw materials (and favorite snack). Because #YouDontJustEatEm. Lily Butler is an Associate Content Producer for Studio@Gawker. This post is a sponsored collaboration between Pringles and Studio@Gawker.